everyone worry about their jobs. 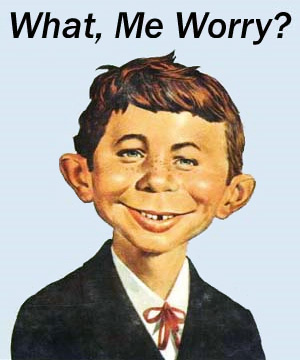 I’m a former (and on occasion, present) worrier. Several years ago I realized three things. allow me to take action where I can have control. something that is not real is a waste of time. physical exercise to energize myself. and powerful, which pushed out the obsessive, worrying thought. situations that didn’t go my way, or changed the negative messages I gave myself. didn’t hesitate to ask their help when I needed it. nuts (After a good workout, of course). Simma Lieberman is the author of Putting Diversity to Work and a member of The Million Dollar Consultant® Hall of Fame. Simma Lieberman Associates works to create workplace cultures where people love to do their best work and customers love to do business. Read the Inclusionist blog. Follow her on twitter: @theinclusionist. Subscribe to her newsletter.